Having relied upon Eden Hazard (£10.2m) as his captain in each of his previous seven fixtures, Jokull Kristjansson decided on a change of approach ahead of Fantasy Premier League Gameweek 24. Turning to Romelu Lukaku (£9.7m) for Everton’s Goodison Park meeting with AFC Bournemouth, Jokull chose to play his Triple Captain chip - with devastating effect. The Toffees forward scored four goals in a 6-3 win, providing 63 of Jokull's unbeatable 146-point Gameweek total, making him the FPL Manager of the Week. His faith in the Everton striker had been resolute to that point. An ever-present in Jokull's squad since Gameweek 1, Lukaku was made captain or vice captain in 22 of the opening 24 Gameweeks. A member of the Manchester United fans' league, Jokull also witnessed Red Devils duo Antonio Valencia (£5.6m) and Henrikh Mkhitaryan (£8.8m) provide 25 points at Leicester City, with the latter producing a season-high tally of 14. Jermain Defoe (£7.8m), Gylfi Sigurdsson (£7.4m) and the aforementioned Hazard all found the net, while at the back, Tottenham Hotspur pair Hugo Lloris (£5.5m) and Kyle Walker (£6.3m) delivered a combined 14 points from Spurs' 11th shutout of the season. Jokull's foray into the transfer market also reaped rewards as Robert Snodgrass (£5.8m) and Troy Deeney (£6.7m), his two new acquisitions for Gameweek 24, supplied a goal and assist respectively. The Icelandic manager could even afford to bench Hulll City's Eldin Jakupovic (£4.0m) and Gareth McAuley (£5.0m), of West Bromwich Albion, and still achieve success. Remarkably, if he had opted for McAuley over Chelsea’s Cesar Azpilicueta (£6.6m), all 11 of his Gameweek 24 starters would have produced returns. 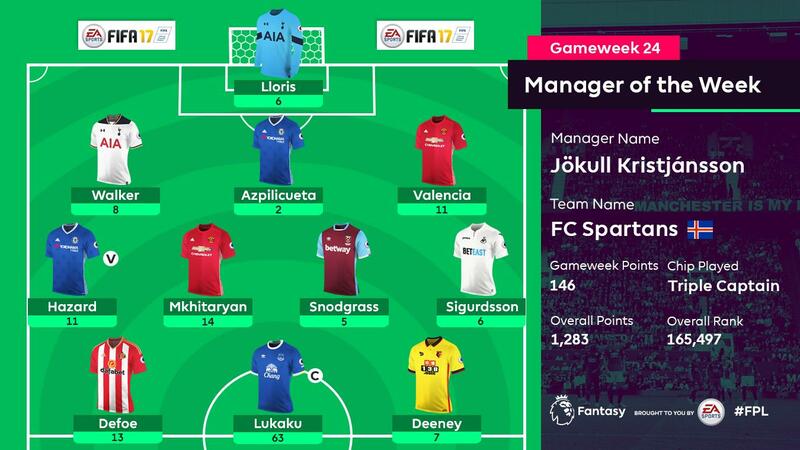 Coupled with a top 25,000-placed finish in the previous round of fixtures, Jokull has soared up the FPL rankings, moving from 1,173,983 to 165,497 overall in two Gameweeks. He wins a copy of FIFA 17, a Nike Ordem 4 match ball and an FPL mug, all packaged in a Fantasy Premier League rucksack.